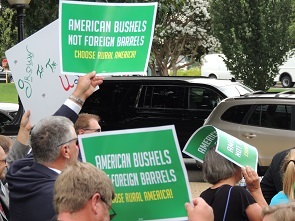 WASHINGTON, July 15, 2015 — More than 300 corn farmers and ethanol industry leaders rallied on Capitol Hill today to protest the Obama administration’s proposed Renewable Fuel Standard (RFS) requirements. Among other things, the Environmental Protection Agency is proposing cutting the RFS for corn ethanol by 3.75 billion gallons through 2016. That represents nearly 1.5 billion bushels in lost corn demand, according to NCGA. 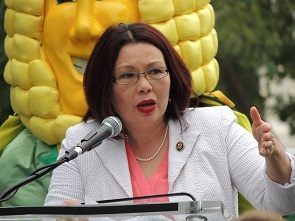 Another speaker at the event, Rep. Tammy Duckworth, D-Ill., a veteran and a member of the House Armed Services Committee, said maintaining the RFS will decrease American dependence on foreign oil. “I see renewable, home-grown fuel as not only critical for our environment and our economy, but also as a national security imperative,” she said. The EPA released its proposals for Renewable Volume Obligations (RVOs) for biofuels under the RFS for 2014, 2015 and 2016 in May. The figures show an increase in required blending, but they are below statutory levels set in the original legislation governing the RFS passed in the 2005 and expanded in 2007. Proposed 2014 RVOs, which are meant to reflect the actual amount of domestic biofuel used last year, include a requirement for total renewable fuel set at 15.93 billion gallons. Statutory requirements for 2014 called for 18.15 billion gallons. In 2015, EPA is proposing 16.3 billion gallons of renewable fuels, below the statutory requirement of 20.5 billion gallons. And in 2016, the agency suggests 17.4 billion gallons of biofuels - a jump of about 1.5 billion gallons from actual 2014 production, but below the statutory requirement of 22.25 billion gallons of total renewable fuel. NCGA members took their message to congressional offices after the rally. 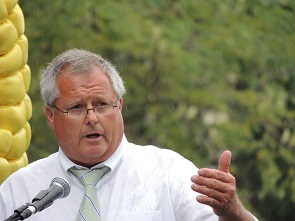 “We must hold Congress to its promises – and hold the EPA to the law,” NCGA President Chip Bowling told his members. In its proposal, EPA cites the “blend wall,” – the theory that consumers can only purchase and use a certain amount of renewable fuels without mixing those fuels – specifically corn ethanol – at higher blends such as E15 or E85. Most gasoline is now blended with 10 percent ethanol (E10). Renewable fuel advocates contend that the blend wall is an artificial construct promoted by oil companies in their reluctance to offer higher blends of fuel.